It helps to analyze images with one click. It is possible to copy the stabilization metadata for other clips. It can help to stabilize shots along with pans. Clips can be analyzed in forward as well as backward motion. It offers real time playback over analyzed images. The variable frame smoothing process is applied over camera pans. In this article, we will show you two ways to stabilize your shaky videos: One way is stabilizing the video with DaVinci Resolve, the other way is removing shake in video with Wondershare Filmora video editor. Select Full Feature Mode after launching Filmora. Import your video footage to the Media Library. Select the video footage in the Media Library, right click and choose Video Stabilization from the sub menu. Drag the sliders to select the section need to stabilize, and then click Analyze Shakes to start the stabilizing process. Play the video footage to check the stabilization effects and adjust the smooth level if necessary. Click the Save button if the result is OK. Step 1: First of all, you need to select Action Cam Tool from Filmora splash screen. Step 2: Import your desired files. Step 3: Finally select the stabilization option from the Fix tab. 1: First of all, you need to analyze the clip. 2: Select the desired stabilization settings. 3: Click the Stabilize button and you will find all the results on screen. To access the Stabilizer feature, go to Tracker Palette and switch window to Stabilizer. Now click the Track Forward button for analyzing the clip. This analysis line works with different settings and allows users to follow stabilization process with rotation, zoom, tilt and pan settings. It is time to fine tune your content with zoom, smooth and strong settings. In order to fine tune your results with stabilization process, you have to adjust the Smooth and Strong settings. 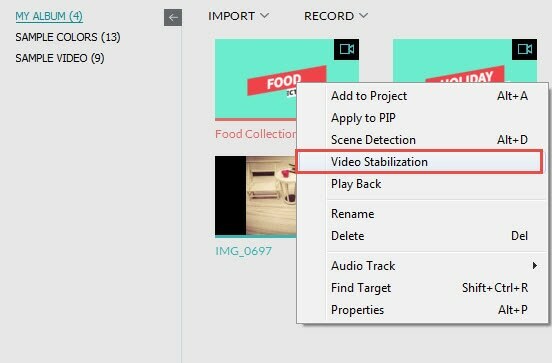 Both parameters help to control the overall process and also show the results about amount of stabilization that is applied to your video clip. Now you have to move to the clip start point and then click the Stabilize button that is available on bottom left portion of tracker palette. Note: if you still find some blanking issue on frame edges, then you must remove them using the Zoom option. The Zoom option can help you to remove the black edges from your videos, which are present in clips due to camera repositioning and movement related issues. Once this analyzing process is complete, then you can set the stabilization settings as per need. In case if blanking artifacts are still causing some trouble on edges of the frame, then you can prefer to utilize Sizing Palette to remove them. Use manual zoom option to remove blanking from the frame and soon you will be able to achieve the desired results. At the end, you must calculate your stabilization results. Those who want to exclude certain specific elements from their video clips then you have to re-analyze your footage because this process required unique set of data. Then bring slider to 95 position and click the Stabilize button. It will remove most of your pan data. After that, you can render and export the video footage per your need. Watch the video below to check how to use Filmora to edit video easily, and download it and try now.